If you’ve followed XDA for a while, you will likely know that we have somewhat mixed feelings towards Sony and the attitude they used to (notice the use of past tense) take towards the developer community. If anyone remembers back to the legal battle against George Hotz, where a multi-million dollar corporation essentially went full force against an underground developer/hacker for letting people know how to run CFW (custom firmware) on their Playstation consoles, it was something that earned (and rightfully so) the rage and anger of the entire modder community. However, it seems that the Japanese conglomerate is turning around and trying a different approach towards this group of customers (us). 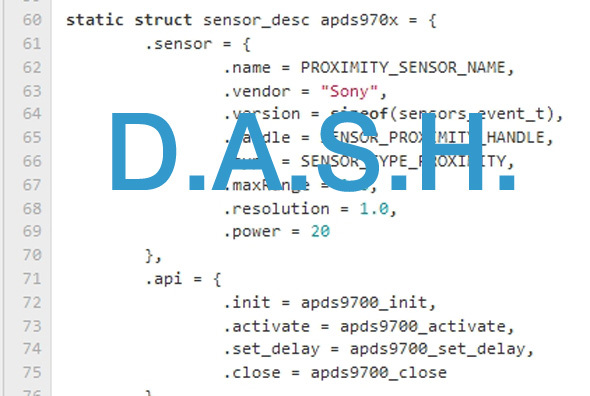 According to a recent post on Google+ by XDA Recognized Developer cyanogen, Sony has literally opened the flood gates by adding the Dynamic Android Sensor Hardware Abstraction Layer (DASH for short) to the world of open source. What this means essentially is that now developers have access to and can contribute towards the development and betterment of the code behind the sensor hardware’s inner workings. This is rather interesting, and quite a big step for manufacturers, since this kind of information is usually obtained via reverse engineering, espionage, or (normally) not at all. Most developers out there who work on porting operating systems (like in this case, cyanogen) spend monumental amounts of time digging through bits and pieces of information that is scarcely available to try and fix bugs caused by incompatibilities between the custom code and the closed source code. So, this addition will have a benefit for both parties: on one side, developers will not have to spend countless hours trying to figure out how to make things work because they will have access to the actual code from the same people who make these. On the other hand, Sony will benefit from the added expertise of the modding community, as we have a bit of a reputation when it comes to finding bugs in manufacturer’s products. This goes hand in hand with the addition of the Xperia S to the device vendor list in the AOSP source. This is indeed quite a change of heart by the same people who just a little over two years ago were in absolute denial and going after underground hackers, who ironically were their customers and a big driving force behind a percentage of their sales. Keep going down the right path, Sony! We are proud of you and we sincerely hope that the others will follow your example as well (ahem… HTC… we hope you are taking down notes). Last but not least, a big thumbs up for cyanogen and his team for opening Sony’s eyes. Way to go, guys! You can find more information in the original article from Sony’s blog. You can also read cyanogen’s comments on his G+ page.